Nov. 29, 2018 -- Randy Strickland walked into the ER at North Metro Medical Center burning with fever and trembling. He told the man and the woman who were staffing the triage desk that he was nauseated and felt like he needed to throw up. The emergency room was nearly empty. Randy was a volunteer at the Jacksonville, AR, hospital and hoped he would get home quickly. But repeated visits by his wife, Mary, and son James to the triage desk didn't bring Randy any closer to getting care. Over the next 2 hours, he lost his ability to speak or respond to questions. His breathing became labored. Finally, on a trip to the bathroom, his legs buckled as he held onto Mary for support. “I can't hold him up!” Mary yelled as she pounded on the wall that separated the bathroom from the triage desk, trying to summon the ER attendants. “It's just -- I don't know what they're waiting for,” James says. After a pause, the dispatcher asks if they can get Randy out to his car in the parking lot, where paramedics could pick him up. When the paramedics pulled up, Mary says, they knew immediately that Randy was too sick to be taken to another hospital. They took him back into the ER through an entrance used by ambulance crews, and the hospital's medical teams finally jumped into action. But by that time, Randy was critically ill.
"Is he gone?" Mary asked. “He is, but we're going to do CPR until you tell us to stop,” he told her. Administrators at North Metro Medical Center and its parent company, Allegiance Health Management, based in Shreveport, LA, did not respond to numerous requests for comment on the EMTALA citations. Violators represent about a third of the nation's approximately 5,500 hospitals, according to statistics from the American Hospital Association. Florida was the worst state in the nation for the number of violations, followed by Texas, Pennsylvania, New York, California, and Georgia. Smaller hospitals -- those with fewer than 100 beds -- accounted for the largest number of violations -- 1,488, or 34% of the total. Yet experts say the raw numbers don't accurately reflect both the scope and severity of the problems they see. That's because enforcement of the law depends on someone filing a complaint. Although anyone can file a complaint, it's most often a doctor, nurse, or hospital administrator. Howie Mell, MD, an emergency doctor in Chicago and a spokesman for the American College of Emergency Physicians, says that when someone from a hospital makes a complaint about what happened at another hospital, both hospitals are investigated. While complaints are anonymous, investigations can be rigorous, and they often catch smaller violations -- like failing to post signs about patient rights in an emergency room -- along with larger ones that directly affect patient care. Given that fact, he says, when you do see an EMTALA violation recorded in the system, it's usually because something really serious happened. “They were either really egregious, or what you're seeing is the tip of the iceberg” for that hospital, Mell says. EMTALA, signed into law by President Ronald Reagan in 1986, was designed to prevent the practice of so-called wallet biopsies -- where hospitals would turn away patients who couldn't prove they had financial resources like health insurance to pay for their care. Those patients ended up at public hospitals, often in unstable conditions. They died about three times more often than patients who were not transferred this way, according to an influential 1986 study on the practice. Instead, our investigation found that hospitals seem to be breaking the law because they lack the resources to provide the level of care the law requires. “An EMTALA [violation] usually implies you don't have the resources to take care of the patient at your facility. Smaller hospitals have fewer resources,” says Boykin Robinson, MD, an emergency doctor who runs the Atlanta-based Core Clinical Partners, a company that staffs emergency rooms. That's what happened to Theresa Kuhn, 58, a nurse and high school health sciences teacher from Social Circle, GA.
By Sunday morning, she was in unbearable pain. Her doctor's office advised going to the closest emergency room. That was at Piedmont Newton Hospital, a 103-bed hospital in nearby Covington. To take her to Gwinnett Medical Center, the hospital system that had originally treated her, would have taken them another hour, says her ex-husband Brian Kuhn, of Conyers, GA, who drove her to the hospital. “Shouldn't we be concerned about time?” Brian asked. Brian was stunned. A medical helicopter came to pick up Theresa. It was 5:30 p.m. By that time, she had spent nearly 4 hours in the Piedmont Newton ER. The doctor who did her original procedure met Brian and Theresa's daughter, Lauren, and told them he was going to rush Theresa into surgery. They removed part of her colon and took out the surrounding infection. Brian says the doctor told them the surgery went well. Federal investigators cited Piedmont Newton for failing to stabilize Theresa and for transferring her to another hospital even though it wasn't safe to move her. In their report on the case, investigators determined the surgeon who transferred Theresa had the skill and resources to perform the needed operation. In an interview with investigators, the surgeon says in her 34 years of practice, she'd never heard of EMTALA and wasn't familiar with the law, records show. Piedmont Healthcare, which acquired the Newton hospital just months before the incident, declined to comment on the specifics of Theresa's case or the violations they were cited for as a result. Like the other families interviewed for this story, Theresa's relatives had no idea that her case had been the subject of a federal investigation. “I felt in my heart that this was 100% preventable,” says Sarah Homer, Theresa's sister who lives in Tampa, FL. She's taking care of Lauren, who was in college when Theresa died. Small hospitals are more likely to serve more rural populations. They're also more likely than larger hospitals to be financially fragile, says Jimmy Lewis, CEO of HomeTown Health, an association of rural hospitals in Georgia and Florida. At Hill Hospital of Sumter County in York, AL, a rural community just across the state line from Mississippi, federal investigators found an envelope labeled N.P.A. -- for “No Physician Available.” It contained records on 38 patients who came to the emergency room for help when there was no doctor there to treat them at the 27-bed facility. The cases, which included two deaths, spanned a 4-month period from 2017 to 2018. The violations were so serious, the federal government threatened to end the hospital's contract with Medicare, though that didn't happen. One of those patients was Quarmaine Seals, a 25-year-old truck driver and father of two young children. He was also a motorcycle enthusiast. According to a police report, he was riding a motorcycle down a two-lane highway in York the night of Sept. 1, 2017, when a car backed out of a driveway onto the rural road in front of him. The police report estimates Seals was traveling 100 miles per hour in a 35-mile-per-hour zone. He struck the passenger side door and flew 30 feet over the car. Witnesses found him thrown into the bushes, his body wrapped around a metal hand railing along the walkway to a house. In this small town, where everyone knows everyone else, Willie Seals, Quarmaine's mother, had been called about the accident and was already at the hospital when they wheeled her son's broken body into a trauma room. The stress of seeing him caused her to collapse. Paramedics loaded her into an ambulance and drove her to the next closest hospital, in Meridian, MS, for care. Gena Springfield, a former nurse who worked at Hill Hospital off and on for 2 to 3 years, says the hospital was having trouble paying its staff, even as far back as 2014, when she was there. “That's why I quit working there, because they couldn't pay the nurses, they couldn't pay the doctors. We didn't have the things we needed to work there with. I mean, it was dangerous,” she says. “We have a lot of people who come to our hospital who can't pay. We have to provide these services. Nobody pays for that. We don't have the population with access to insurance,” Wilson says. When resources fall short, they're supposed to notify CMS and local ambulance crews that they can't take emergency patients. They're also supposed to post a public notice. Hill Hospital failed to do that. In Quarmaine Seals' case, no one had told the paramedics who brought him to the hospital that it didn't have a doctor available. “Care can be quite expensive, and there's no money that would pay for that care, which is required. That's where we get into the unfunded mandate. We agree with the mandate; we just think there ought to be funds available to pay for it,” says Michael Carius, MD, a spokesman for the American College of Emergency Physicians, or ACEP. ACEP has worked with Congress to introduce two bills to try to relieve some of the financial pressure that the law creates for hospitals. The first would create a way to get the government to reimburse hospitals when they provide care that isn't paid for. The second approach, which is less direct, would shield doctors who treat ER patients from lawsuits, Carius says. “I think it's really important that there be strong enforcement of this law because consumers are not in a position to enforce this themselves,” she says. Before 2015, fines levied under EMTALA had been authorized under the Social Security Act and were exempt from adjustment for inflation. That means in 30 years, they'd never gone up, says April Washington, a spokeswoman for CMS. Each violation could cost a doctor or hospital up to $50,000. The penalty for hospitals with fewer than 25 beds was $25,000 per violation. In 2015, Congress passed the Federal Civil Penalties Inflation Adjustment Act, which effectively doubled EMTALA fines and those levied by other federal agencies “to maintain their deterrent effect,” says Washington. 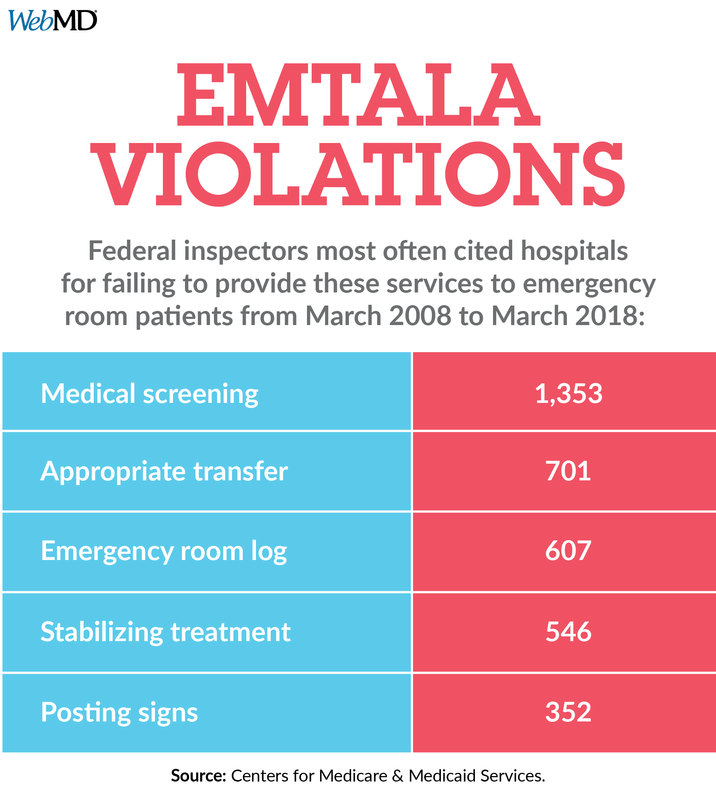 The adjustment recently resulted in the largest fine ever levied against a hospital for an EMTALA violation -- nearly $1.3 million. The nonprofit AnMed hospital system, which serves South Carolina, settled with the Justice Department after investigators found the three hospitals were “boarding” dozens of mental health patients in their emergency room for as long as 38 days when they had open psychiatric beds at the same facilities. The patients had been involuntarily committed. The hospital had a longstanding policy of transferring involuntarily committed patients to the state psychiatric hospital, rather than accepting them to their in-house psychiatric unit, according to news reports. The state mental hospital was short of space, prompting long waits for transfer. The massive fine was seen by some health law experts as a warning to hospitals that CMS was beefing up its response to hospitals that don't follow EMTALA when it comes to mental health. Washington of CMS says the federal agency is looking at other ways to boost EMTALA enforcement, too. For example, most cases are investigated and enforced by state health care regulators that contract with the federal government. That's not always an effective system, especially if state regulators are too stretched or too intimidated by their local hospitals to offer strong enforcement. To remedy that, CMS says it’s providing technical support to help state survey agencies with difficult investigations. And the federal agency added that it has increased outreach and support to medical providers so they can understand EMTALA requirements. But for now, patients wouldn't necessarily know they've arrived at a struggling facility until it's too late. North Metro, the hospital where Randy Strickland died, is a 64-bed hospital in Jacksonville, AR, a suburb about 20 minutes northeast of Little Rock. Once a vital part of the town, the facility has fallen on hard times in recent years. The hospital owes millions to the federal government for back taxes and fraudulent Medicare billing, and it faced several lawsuits from vendors who were not paid. Staff turnover has been high. The hospital has had six CEOs in the last 5 years and a string of medical chiefs of staff. Medicare's Hospital Compare website gives the hospital 1 out of 5 stars for quality. It lags state and national averages for several measures of “timely and effective care.” At North Metro, for example, patients with chest pain wait an average of 70 minutes before they get an EKG -- a test that helps to diagnose a heart attack. In the rest of the state and nation, patients with chest pain wait an average of just 7 minutes before they get that test, the data show. Only 3% of patients treated at North Metro received the right care for sepsis or septic shock, compared with 47% of such patients in Arkansas and 49% of patients nationally. Tracy Phillips, DO, was the hospital's chief of staff when he treated Randy Strickland the night he died. Phillips says he was at a concert when he got a call from a doctor on duty that he needed help with a patient. He says he was at the hospital within 10 minutes. Phillips was eventually able to put a tube down Randy's throat to help him breathe and insert an IV, but those measures came nearly 3 hours too late. The clerk at the front desk had told James, Randy's son, that they couldn't take Randy back because they were attending to a priority patient. The nurse on duty had left early -- about a half-hour before the end of her shift -- without telling anyone, Phillips says. After Randy's case, Phillips says he changed ER triage procedures so that patients with low blood pressures or rapid heart rates were brought straight back to see a doctor. “They just didn't bring the guy back. They didn't think he was that sick,” Phillips says. Clarification: CMS on Dec. 3 clarified previous statements regarding assistance to state survey teams’ investigations in EMTALA cases as technical support along with outreach to medical providers, and not proposed federal teams. Brian Kuhn, Theresa Kuhn's ex-husband, Conyers, GA.
Sarah Homer, Theresa Kuhn's sister, Tampa, FL. Willie Seals, Quarmaine Seals' mother, York, AL.